Who says school has to last all day? There is nothing sacred about going to your workplace soon after you wake up in the morning and staying there until late afternoon, five days a week. Around the world, things are done differently. A close friend lived in Argentina, and has just returned from a visit there. I will see her this weekend, which reminded me of the ordinary yet surprising way things are done differently there. When I visited her family in Argentina, I never saw the kids in the morning – they had gone out long before I surfaced – school starts at 8am in Argentina. But they were back home by lunchtime! In Argentina, it is normal that children do either morning school or afternoon school. That is how it works. In the afternoon, my friend’s kids would do homework, go out to music or language classes, hang out with friends, or just hang out. It varied. I don’t know the reasons for this Argentine system – probably something to do with sharing out of public resources, and something to do with national tradition, and nothing at all to do with notions of a shorter working week (and it caused obvious childcare headaches for adult friends of the friends who did have full time jobs). But it seems to me a very interesting way to teach from an early age that work is not the whole of life and that you have to learn how to use your flexible time, as well as an interesting and little-known example of a different way of doing things. My own kids, having heard about Argentine half-day school, now think their own full school days are deeply unfair. They also ask me pretty well every Friday whether I have succeeded yet in my quest to campaign for a three day weekend for all. Better get on with it. Why do we work 40 hours and have a two day weekend? There’s nothing essential about our entrenched 35-40 hour standard working week. It hasn’t always been this way. There isn’t even anything essential about the week comprising seven days. That’s hard to get your head round, but think about it… why should the week be seven days long? No reason. It doesn’t relate to anything in nature, or anything else. It’s arbitrary. The seven day week seems to have been invented in ancient Babylon. Robert Owen, the utopian socialist, was an early advocate of limits to working hours. He petitioned for working hours restrictions throughout Europe in 1818. This was rejected as ‘lunatic’. But despite the perceived lunacy of the idea, restrictions to working hours did start to emerge in the UK. Children we the first to benefit – in the Factory Acts of 1831 and 1833 children under 18 were no longer permitted to work longer than 12 hours a day. Hardly a massive achievement by today’s standards – but further change followed rapidly. Barely more than a decade later, in 1844, the adult working day was limited to 12 hours, and children’s to 6.5 hours. In the second half of the 19th century, pressure for the eight hour day grew. The ‘Eight Hour League’, under the famous slogan “eight hours work, eight hours rest, eight hours what you will” successfully pressured the Trades Union Congress to adopt eight hour days as a goal, around the turn of the century. Sidney Webb, one of the founders of modern sociology, was also an advocate. However, while the eight hour day has indeed become the standard in the UK, there is no legislation requiring it (although there is legislation limiting the total working week to 48 hours). The eight hour day became the norm piece by piece through the struggles of individual workplaces. By 1930 weekly hours in Britain were down to 47 and by 1980 to 40. Similarly, in the middle of the 19th century, a six day working week was taken as given. One explanation given for the weekend is that some Britons (not your ancestors, obviously) tended to spend their one day off drinking more than praying – opting for gin rather than chapel, so to speak -and would then skip work on Mondays to recover. The 1850 Factory Act thus provided for a half day on Saturdays, allowing the rest of Saturday for merriment and enabling everyone to turn up bright eyed and bushy tailed on Monday morning. The full two day weekend is said to have originated in parts of the US, to accommodate the Jewish community whose day of religious observance in Saturday, and to have been cemented by the Great Depression. The point is that it was previously thought that particular lengths and patterns to working weeks were somehow natural, and that reducing their length would bring economic ruin. It didn’t. Almost a fifth of Britons in employment work over 45 hours a week, according to the Office of National Statistics. That’s over 6 million of us. Three quarters of these long-hour workers are men and a quarter women. 45 hours is equivalent to a six day week. We moved from a six- to a five-day working week a century ago, but it seems that 20 per cent of people working in Britain today aren’t yet benefiting . The only part time economy in the world? In the Netherlands, average working hours are only about 30 per week – the highest rate of part time work among rich nations. It also has the lowest proportion of involuntary part time employment, as a share of all part time workers. The Netherlands has been called ‘the only part time economy in the world’. How has this happened? By the late 1990s, the Netherlands had developed a slightly different working pattern from the EU average. 55% of EU households without children had two earners, and this number, at 60%, was similar in the Netherlands. 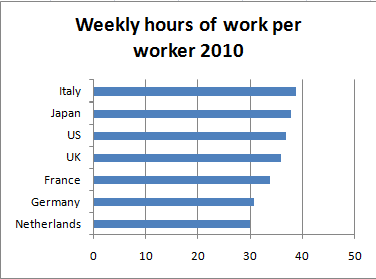 But just 20% of Dutch households had two full time workers, compared with 37% across the EU. Conversely 35% had one full- and one part-time worker (“one and a half households”) – this proportion was 17% for the whole EU. Households with children had roughly similar proportions – apart from a very markedly low number with 2 full time workers – only 4%, compared with 29% for the whole EU. The Netherlands has made an important policy choice, supporting its trend towards lower working hours. The Working hours Adjustment Act 2000 gives all Dutch workers the right to request to change either from full- to part-time or vice versa. The employer can only refuse if they can demonstrate significant business or organisational interests in the way. There is also a requirement for equal treatment of part- and full-time workers, in Dutch law and also in the European Part-Time Workers Directive of 1997. In 1997, former Dutch prime minister Ruud Lubbers said, “It is true that the Dutch are not aiming to maximise gross national product per capita. Rather, we are seeking to attain a high quality of life, a just, participatory and sustainable society that is cohesive… While the Dutch economy is very efficient per working hour, the number of working hours per citizen are rather limited… We like it that way. Needless to say, there is more room for all those important aspects of our lives that are not part of our jobs, for which we are not paid and for which there is never enough time.” Hurray to that. And the Dutch economy has not collapsed, either. Which countries work most and hardest? Thus, average weekly working hours per worker vary substantially, and working hours have fallen substantially in all seven countries since 1950. Further, the countries whose working hours have decreased more consistently have a higher percentage of their productivity gain taken as a decrease in working hours. So, a reduction in current working hours would continue, rather than reverse, the current trend. 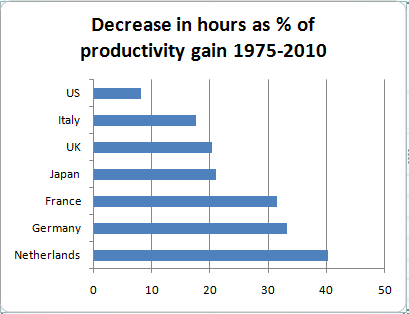 And the variation in productivity gain taken as working hour reduction between countries demonstrates that doing so is a political, rather than economic, choice.